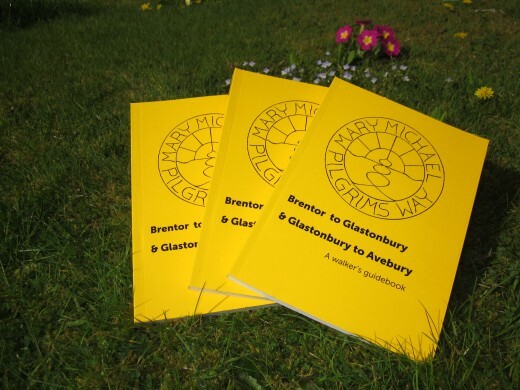 The first guidebook written in 2011 to support pilgrims walking between Brentor and Glastonbury has now been superseded. An updated version for 2015 has been bound together in one volume (192 pages) with the new section guide, Glastonbury to Avebury. The primary purpose of the guidebook remains the same, namely serving as a practical aid to help people get from A to B and find places to stay and eat. It also includes brief background information about interesting features along the way. We have tried to balance functionality with the recognition that the journey is also an opportunity for inner exploration. 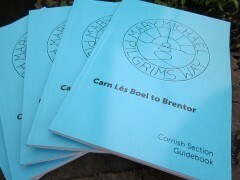 Included in the text are quotations and observations intended to support and deepen the experience of pilgrimage. A second guidebook (115 pages) covers the Cornish section of the route which begins on the cliff tops near Land’s End and joins with the pilot section route at Brentor. In both guidebooks there are maps detailing specific sections of the route, distance charts and text boxes which contain background about places of interest along the way. Separating this from the main text with its route directions and practical information such as details of accommodation options is intended to enhance the clarity and ease of use of the books. You can now buy both guidebooks online (paying with PayPal or debit/credit card).